A facial recipe for facial masks is desired by many because of the benefits that a facial provides for the skin. Basically, massaging the facial mixture into the skin lightly helps to warm the skin. Having the facial mask rest on the skin for several minutes also helps raise the temperature of the skin. This increase in skin temperature subsequently increases blood circulation in the skin and this helps rejuvenate it because the facial ingredients are able to penetrate better and function more effectively. A facial mask removes deeply embedded dirt from the pores of the skin. This cannot be achieved thoroughly with cleansing alone. Trapped dirt that blocks skin pores often leads to acne breakouts and skin rashes. 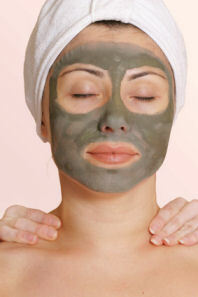 Masks containing clay help to remove excess oil effectively from the skin. Masks also help remove dead skin cells on the surface of the skin, an essential procedure for healthy and glowing skin. Depending on the ingredients, a facial recipe can provide great moisturizing for the skin as well. Anti aging facial masks target the reduction and prevention of fine lines and wrinkles and also tighten the skin. Overall, when these elements are eliminated or reduced the skin looks and feels many years younger. In addition to all these benefits, a facial mask is an effective stress reliever. Most masks require 15 to 20 minutes of time to work. During this time, the person having the facial is lying down and relaxing. Homemade facial recipes are thought by many to be better than store bought products because the ingredients going into the facial recipe can be controlled. Indeed some, but not all, bought facial masks do contain preservatives, fragrances, and other unnecessary chemical additives that are not ideal for good skin health. Therefore, healthy-skincare.com provides some facial recipes below that can be made in the home in order to achieve healthy and younger looking skin. Combine the moisturizer with the grated potato until well mixed. Apply the facial mixture around the eyes and cover with a cool, damp cotton or gauze for 10 to 15 minutes. Combine the ingredients in a blender and blend until the mixture is fluffy. Apply to the skin for about 15 minutes and then rinse off. Use aloe vera juice or water to make a paste. Apply to the face for about 15 to 20 minutes and then rinse off with warm water. Mix all of the ingredients together in a small bowl. Apply the mixture to your face and neck area. Let it dry for about 10 to 15 minutes and then rinse off with warm water. Use water, if necessary, to make a paste. Use a little more clay if the mixture is too runny. Apply to the face for about 15 minutes and then rinse the face with clean warm water. Heat the ingredients together gently to dissolve the gelatin. Let cool until almost set. Apply to face, let dry completely and then peel off. The papaya in this recipe provides enzymes that soften the skin by removing dead cells on the surface of the skin. Mash the ingredients together. Apply to the face and leave on for ten minutes. Rinse well with clean cool water. Mash a banana, some pineapple, and some strawberries together with a fork. Pat the fruity mixture onto face and leave it on the skin for 10 to 15 minutes. Rinse off the mask with cool water. Mash up one tablespoon of ripe avocado and mix in ½ teaspoon of honey. Stir in a little almond meal until the mixture is creamy. Apply to clean skin, leave on for 15-20 minutes, and then wash off with lukewarm water. Below are links to more facial mask recipes.